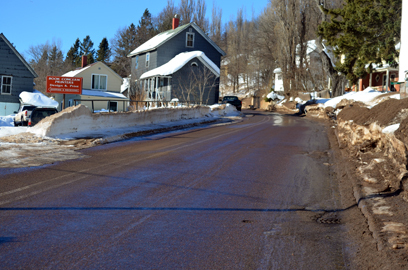 Kurt Hauglie/Daily Mining Gazette A reconstruction project on White Street planned for the upcoming construction season includes filling potholes. HANCOCK — The reconstruction of Reservation and Quincy streets in Hancock finished just three months ago, but there is another street project set for the upcoming construction season. White Street runs from Reservation Street to North Lincoln Drive, which is also U.S. 41. Anderson said the project will include filling potholes and resurfacing the street. White Street will be closed during the project, Anderson said. In May 2014, the city council voted to make White Street one way up bound, and Anderson said after the reconstruction it will remain one way up bound, if that’s what the council wants. “It can be changed back with council’s approval,” he said. Currently there is a marked bicycle lane on the left side of the street, but with the reconstruction there will be one marked lane on each side of the street for up bound and down bound travel. The project must be completed by August, Anderson said. Anderson updated the council on plans for the reconstruction of Front Street, which will take place this summer, also. The plans for the project include efforts to make crossings at the north end of the Portage Lake Lift Bridge safer for pedestrians, including better crosswalk markings and a pedestrian island. The changes should make it easier for drivers to see pedestrians, Anderson said.